African ChangeMakers Awards (ACAwards) identifies and celebrate excellence, leadership, entrepreneurial ingenuity, technology and social innovations in individual, programs, team, group or organizations across Africa and beyond. Honoring dedicated life works, careers, impacting businesses, by recognizing incredible leadership and dedication to building a better community for Africa continent and beyond. African ChangeMakers identifies people or organizations turning problems to solutions on a large scale, defender of humanity, peace & freedom and the planet protection. The African ChangeMakers Awards support projects of a philanthropic, educational, social or civic nature, and other deserving causes in Africa. Awardees will be honored at an Award Reception during African Changemakers Leadership (ACLeads) Forum 2019. African Changemakers is using the SDGs program as the yardstick for most ACAwards for people or organizations to easily identify with an award category(s). African ChangeMakers Rising Star Award – Emerging Leader 18 – 30 years – pursuing careers with portfolio or doing extraordinary things related to tech innovation, social innovation, design thinking, and changemaking. African ChangeMakers Courage Awards — Emerging Leader 18 – 30 years – that choose to make education a priority while facing life challenging events, such as homelessness, heartache, financial hardship, family turmoil, illness, substance abuse and physical disabilities. African ChangeMakers Innovative Education Award – quality education, accessibility, affordability. African ChangeMakers Women Advancement Award – reduce inequalities, domestic violence, education etc. 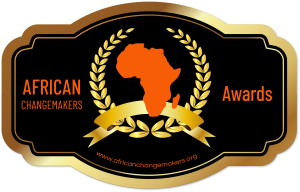 Accepting Nominations for African ChangeMakers Awards 2019. Submit Nomination COMING SOON! COMING SOON !! COMING SOON!!! Nominate an individual or organization who exemplifies the idea of creating positive change. African ChangeMakers Awards Sponsor/Partners/Media House. Calling on all African and International delegates, sponsors, partners, speakers, exhibitors, diaspora and friends of Africa for a unique opportunity to be part of African ChangeMakers Awards and African ChangeMakers Leadership Summit (ACLeads). Do you have a products, services or brand you want the whole Africa to know about, get a table at African ChangeMakers Leadership Summit (ACLeads) to showcase and share your brands and ideas to African ChangeMakers communities and innovators?